Can you ever have too many books? Whether fact or fiction, paper or electronic format, written in your mother tongue or translated from another culture, books and the many literary variations are wondrous. Belfast Book Festival is back this week. And not a mention of football! If you’re fast – and live next door to the Crescent Arts Centre where many of the events are being hosted – you’ve still got time to catch the end of the first of the nine events I’ve highlighted from the eighty or more sessions in the week-long festival programme. Lots of lunchtime as well as evening events. Monday 9 June at 9pm. Crescent Arts Centre. Bankruptcy Collapse Meltdown. Mitch Feierstein (a successful hedge fund manager who has acted as a disaster and contingency planning consultant for a number of governments) will read from and talk about his latest book Planet Ponzi before being joined in discussion by Stacy Herbert (markets and finance broadcaster) and Max Keiser (an outrageous pundit and stock exchange software creator). These three figures from the world of journalism, finance and the global economy. £10. Tuesday 10 June at 8.30pm. Crescent Arts Centre. Talking Myself Home. Ian McMillan is poet-in-residence for Barnsley Football Club and The Academy of Urbanism, and a frequent broadcaster. £8. Wednesday 11 June at 6.30pm. Crescent Arts Centre. Sorry For Your Troubles. You may have caught Pádraig Ó Tuama’s lyrical tones delivering Thought for the Day on Radio Ulster over the past few years. He’s a striking poet and his 2013 collection comes out of his work in reconciliation, telling stories of people who have lived through personal and political conflict. £5. Thursday 12 June at 7pm. Public Records Office NI (PRONI), Titanic Quarter. Aces On Tour: A Showcase Of Up & Coming Literary Voices. Six rising literary starts – who’ve all been awarded grants from Arts Council of NI will be performing: Pauline Burgess (children and adult fiction); Jan Carson (writer); Kenneth Gregory (fantasy novelist); Matt Kirkham (poet); Nathaniel Joseph McAuley (poet); Anthony Quinn (writer and journalist). Free. Friday 13 June at 1pm. Crescent Arts Centre. Randall Stephen Hall: Lunchtime Songs. Spend a distracted lunch break in the company of poetry, interactive songs, projected illustrations and stories … all with a local feel. Free. Friday 13 June from 3-4pm. Crescent Arts Centre. Mixed Up Fairy Tales. A fun-packed workshop using drama-based games to allow children to create brand new angles on classic fairy tales and nursery rhymes. Ages 6 to 8. Free. Saturday 14 June at 6pm. Crescent Arts Centre. Writing On Motherhood. Three writers speak about the tensions between family life and creativity: Sinead Morrissey (inaugural Belfast Poet Laureate); Debi Gliori (children’s writer and illustrator) and Carolyn Jess-Cooke (poet and novelist). £6. Sunday 15 June at 1pm. Crescent Arts Centre. Alan Johnson: This Boy. Stephen Walker will be in conversation with Labour politician, former shadow-Chancellor and former Home Secretary (amongst other cabinet positions) about his childhood memoire and upbringing in the slums of 1950s Notting Hill Gate. £8. Sunday 15 June at 8pm. Crescent Arts Centre. Ann Widdecombe. The Conservative politician and Strictly Come Dancing veteran will be in conversation with Noel Thompson about her family life in Singapore, student life in Birmingham and Oxford, life in Westminster, her conversation to Catholicism in 1993 and her fulsome lifestyle. £8. While the festival technically finishes on the 15 June, a number of other later events are worth noting. Alessandra Celesia’s superb film The Bookseller of Belfast is being screened in the Crescent Arts Centre at 6.30pm on Monday 16 and Thursday 19 June. John Clancy was a second hand bookseller whose love of literature far outlasted his physical bookshop in Smithfield. This award-winning documentary examines the literary character along with the lives of some of those he touched in his local community. John sadly passed away in January 2014. It’s great to see the film getting a couple of local screenings. Strongly recommended. £3. Three superb pieces of theatre running in The MAC at the moment. All looking at the political and social history of Chile and holding up a mirror to the issues we face on this island. You can read extended reviews on Slugger O'Toole. It is estimated that over 3,000 Chileans went missing or were killed in the aftermath of the 11 September 1973 coup. As the audience loiter in the ruined concrete shell of the Tejas Verdes torture centre, leaning against concrete pillars, they hear the disturbing testimony of six women who explain their involvement in the disappearance of one young Chilean woman, Colorina. Over an hour, a series of monologues unravel the horror of the physical torture the “leftish revolutionary” endured. A military doctor tries to explain away the scurrilous rumours of abuse. A friends admits the circumstances in which she grassed on Colorina. A gravedigger relives the consequences of showing some humanity. The final scene is breath taking. At the performance of Villa, the audience seated around an amphitheatre looking down at a circular table with three Chilean women who had been singled out to decide on how to transform the former Villa Grimaldi secret torture centre. Beginning with a vote and it quickly becomes apparent that there are no obvious answers to the question of what to do with the now-demolished site. What will be most powerful? Reconstruct the villa and recreate the atmosphere of the barbaric torture centre? Or build a “big white box of a museum” on the site? After the intermission, the desk and chairs are gone, replaced with a red carpet and a lectern for the second play, Discurso. Out strides President Michelle Bachelet to deliver an imagined bitter-sweet farewell speech at the close of her 2006-2010 presidency of Chile. Abandoning her prepared notes, the off-the-cuff reflection covers her journey through torture (“or not”) to power to change and now to “the centre of guilt”. She regrets - and questions - much. The upstairs and downstairs theatres in the MAC have been reconfigured for the performances, making intimate and novel spaces for audiences to engage with the Chilean plays. 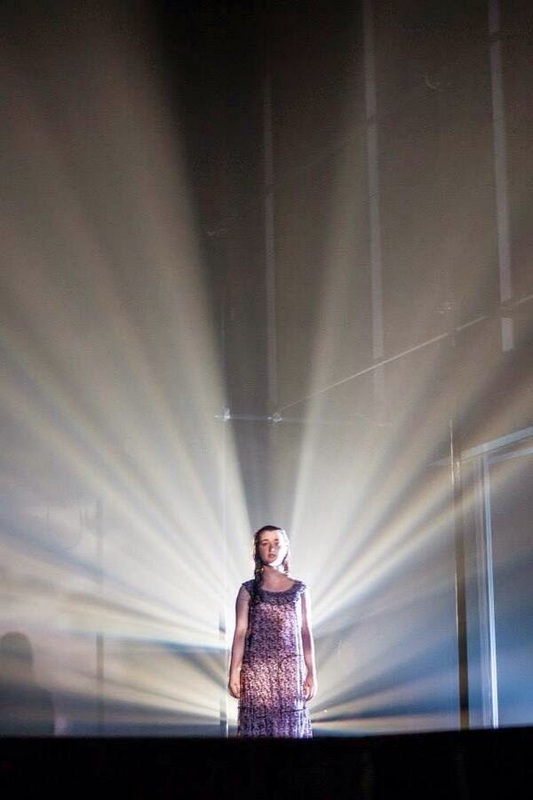 Ciaran Bagnall set and lighting design amplify the performances. A set of plays by Prime Cut which convey the horror that even one barbaric act produces. And the extended tragedy when the cover-up of the truth persists long beyond the lives of those directly affected. 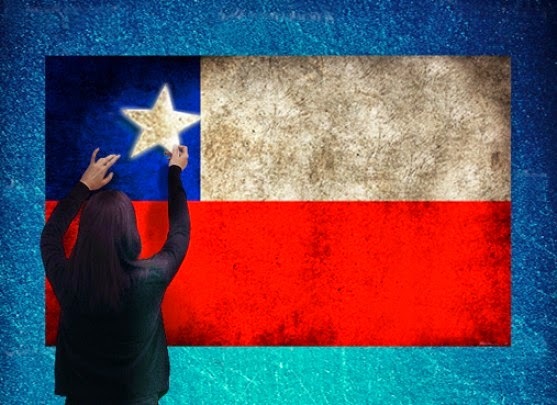 Forty years after the 1973 coup, Chile is telling its story. As we approach the fortieth and fiftieth anniversaries of events on this island, are we ready to face the truths about our situation? Well worth a trip to The MAC to see the shows before the run finishes on 14 June. And if you fancy a binge, all three plays are running back to back on Saturday 7 and 14. Like books, we ‘read’ maps. Like books, maps are full of stories, particularly the ones that have been curated for this exhibition. On the walls, we looked at maps that had been drawn to preserve the names of a local area including a sample from an enormous collection of A3 drawings that Johnny McKeagney cut and paste together (with the help of a photocopier) to capture the style of buildings, the wildlife and the features of a 25 square mile area around the cartographer’s home. A couple of Garrett’s own maps are included: one which documents otherwise unmapped, unofficial border crossings; and another which maps places which exist only in fiction onto a real-world map of Ulster. Some maps were more political. A photowalk discussed the chances of a pregnant women finding toilets to use in the centre of Belfast; and the Forum for Alternative Belfast’s map of unused/wasted space in Belfast. 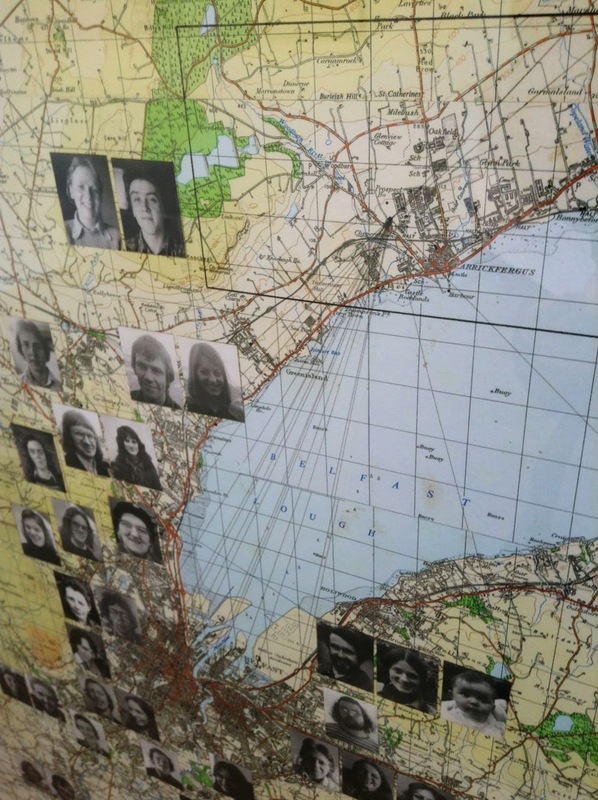 Perhaps the most visually striking map faces visitors as they enter the exhibition. A solid orange circle with a jagged line around its circumference. Realising that Belfast was a largely hub and spoke city where everyone – assisted by the Metro bus routes – travels in from the suburbs towards the city centre before heading back out again, a group of artists attempted to walk around the edge of Belfast. Taking a one mile radius from Queen Street, they plotted their route along roads and paths, sometimes making long diversions to find a bridge to cross the Lagan. 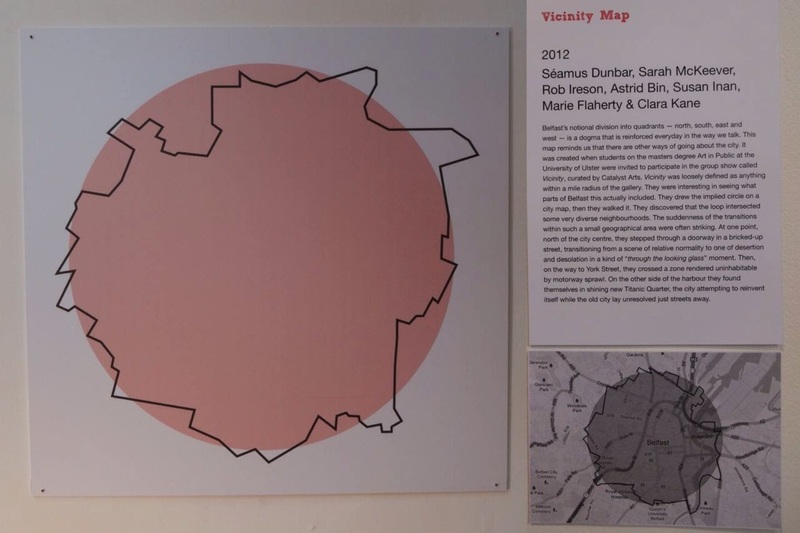 The map proves how badly connected many of the neighbourhoods of Belfast are, and how must arterial roads have sliced communities in two. The highlight has got to John Carson’s ‘friend map’. 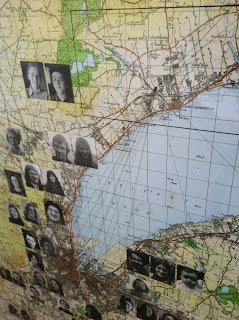 Created in 1976 long before the friendship graphs of Facebook and other social network tools, he stuck photographs of his artistic friends to an Ordinance Survey map of Carrickfergus and the surrounding area. He drew lines from his house to their homes. And then he drew lines between people he thought knew each other. Despite being in the middle of the Troubles, friendships and visits within the artistic community crossed barriers, geographical, cultural and political. 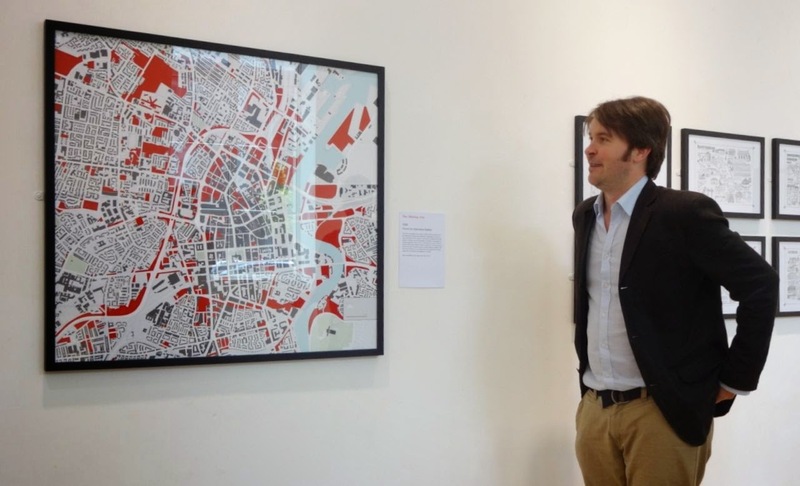 At the conclusion of the tour, Garrett spoke to me about the exhibition and the maps he had chosen to display. You can keep up to date with Garrett Carr’s cartographical exploration on his New Maps of Ulster blog. Worth a visit to the Ulster Museum to wander around the exhibition, gaze at the maps, and read the nearby illuminating legends. The exhibition closes on 22 June. A number of free events are running alongside the exhibition. See the Ulster Museum website for booking details. 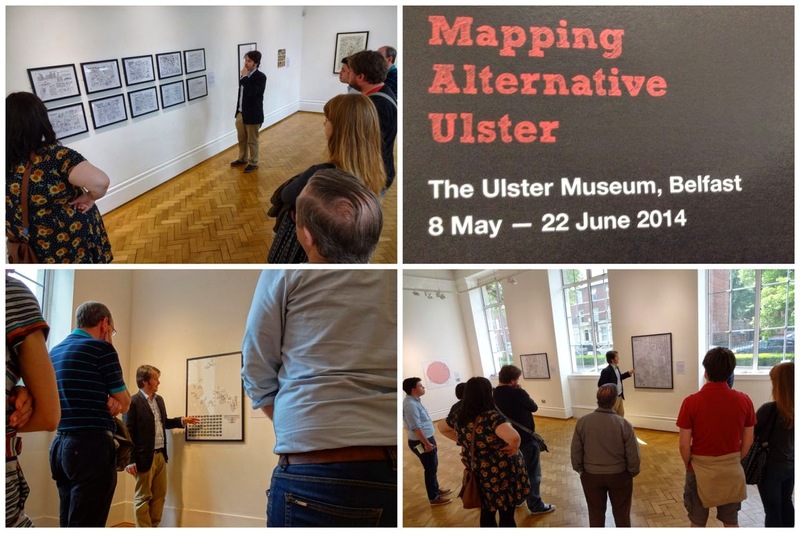 Saturday 7 June at 2pm – Forum for Alternative Belfast will give an illustrated talk asking whether maps can help to stimulate a more honest discussion about Shared Space and divisions in the city of Belfast. Wednesday 11 June at 11am – Up to 25 people can set off on a CROW Walk from the museum to create a 1:1 scale map of their journey, leaving visual markers around the way and creating a trail. Saturday 14 June at 2pm – Dr Keith Lilley will "look behind the map", describing how maps were made before modern surveying and aerial photography, and explaining how old maps tell us stories from the past. And if you’ve time, head upstairs to see the Art of the Troubles collection. 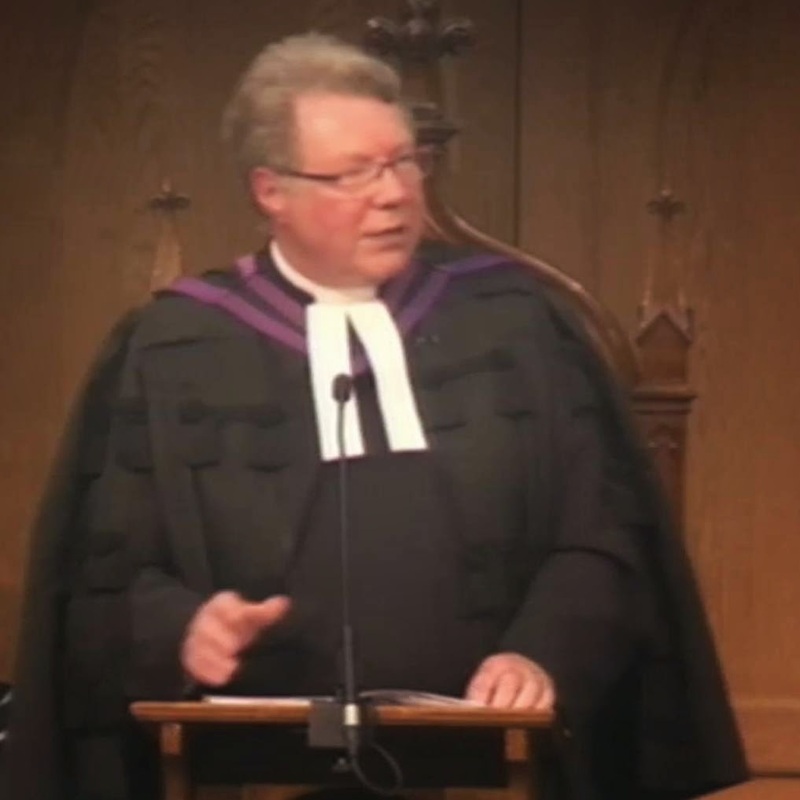 "When I attack another person, whether physically or verbally or emotionally, I am attacking one who bears the image of God"
As well as speaking about his time in Rwanda in 2013, Dr Rob Craig mentioned visits to the Storehouse foodbank which is supported by many different denominations. 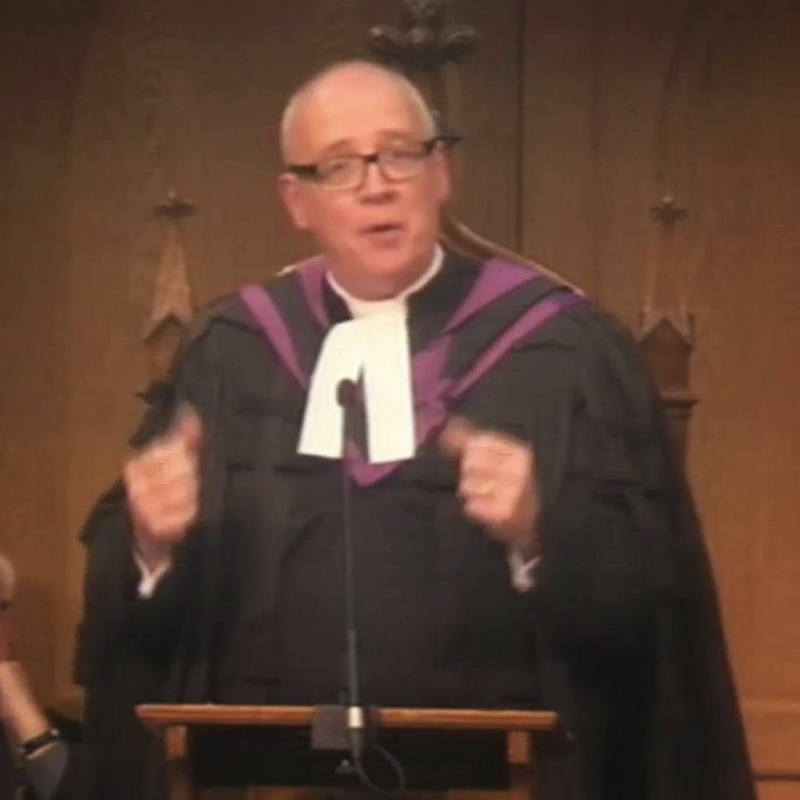 He also referenced his twitter followers and the immediacy it allowed him to react to events and connect with the church. Before his arrival the young people present started a Mexican wave. Political, civic and religious leaders – we all joined in. And somewhere in that moment of Transformation in my heart the words of Van Morrison echo about “days like this”. In April of this year I found myself as a guest at the Reception in Windsor Castle – mingling with all kinds of people from our society, North and South. The visit of President Higgins mirroring the visit of the Queen to Ireland in 2011. Again, in that moment of Transformation, I hear Van Morrison singing about “days like this”. But, in between and surrounding those two events we also experienced; over the summer, violence erupting on the streets of North Belfast; before Christmas, many of the hopes of agreement at the Haass talks evaporating over the New Year; and as the year unfolds an increase in race related attacks and stalemate over Welfare Reform. “Days like this” – The generosity of spirit, the glimpses of grace and Transformation have at times been overshadowed. And what we may have witnessed in our public life, I suspect, will also have been true both in our personal and congregational lives together. Moments of Transformation when, with the wind in your back, you are longing for more days like this. And then, when the goodwill disappears and you feel a gale force wind in your face. In all my years as a minister I have had the foolhardy courage to read these words and the passage of Scripture in which they are found at every funeral which I conduct; standing at an open grave, immediately prior to the words of committal, like all my colleagues I affirm to the grieving family and all who grieve with them these words “I am making everything new”. In the face of death, this word of promise and hope from the risen Lord has inspired one generation after another, transforming them, their faith and their outlook on life. As we, personally, as a church, as a society journey on through life, may these same words be our inspiration – not least in those moments when we are tempted to think only of ourselves, or when despair in face of trials would paralyse us. Let me highlight for you briefly two facets of this word of Transformation, I am making everything new. First, the book of the Revelation is full of colourful images and pictures which stay in the heart and mind long after we have read the book or heard the sermon. One of the most significant is the image of a throne – not just any throne and certainly not an earthly throne. It is the throne of heaven. John the Exile shared with his generation this Revelation, this picture which has sustained many subsequent generations of faithful Christian people through the darkest of days – that life, which is often out of our control, is never out of God’s control. When you and I are tempted to believe that the forces of evil are winning, when we are tempted to hide away in our own personal worlds or to give up in despair let us remind ourselves that it is the One who is seated on the Throne who is making everything new. Every Saturday night during the football season the TV news reporter will give us the well known warning “If you don’t want to know the score, look away now.” In my experience, they never give you time to change channel or turn the TV off. Through all of its pictures and images the Revelation of John paints for us a theme found throughout the Scriptures – that God is the King; He is in charge – we know the final score. Secondly, at the rise of sounding very pedantic, please notice the tense – what we call present continuous. The voice from the throne does not say “one day I will make everything new”. The voice says, “I am making everything new.” This making things new, this work of transformation to which we have been called is already under way. Jesus’ first sermon was to announce that the Kingdom had come; His parables illustrate how His kingdom works, in His death he was the king crucified and by His resurrection He is the all-conquering king. The message of his words to us is to resist all temptation to turn in on ourselves, to resist all temptation to give up in despair, it is to enter his kingdom, to pray for His kingdom and to do the work of His kingdom. Earlier this year, one of our daughters invested in a new car. Until she bought her car I don’t think I had ever noticed how many of the same make and model are on the road. I had been blind; my eyes were closed to them. Now I see them everywhere. In that experience I have come to understand how it can be with God’s word of Transformation both in and through our lives. We can be blind to it and not recognise what He is doing and how He is working around us. In conclusion, one final image – it is that of the BBC broadcasting to the occupied peoples of Europe during the Second World War. Their broadcasts began with a drumbeat thumping out three short beats followed by a longer beat – signalling on a drum the Morse code letter V, for Victory. Tonight I offer you not 4 drumbeats but 5 words. “I am making everything new”. They don't come from the Moderator; they come from the throne; they come from our Lord and our God. And as we leave a service like this, and return to your world and my world, to your congregation and my congregation, to our society that is still in need of transformation, let us go out with these words in heart and mind, may they be our inspiration. “I am making everything new”. A few weeks ago the congregation of Sandys Street in Newry presented me with these Moderatorial robes. We had a congregation made up of members and former members and friends from across the community. 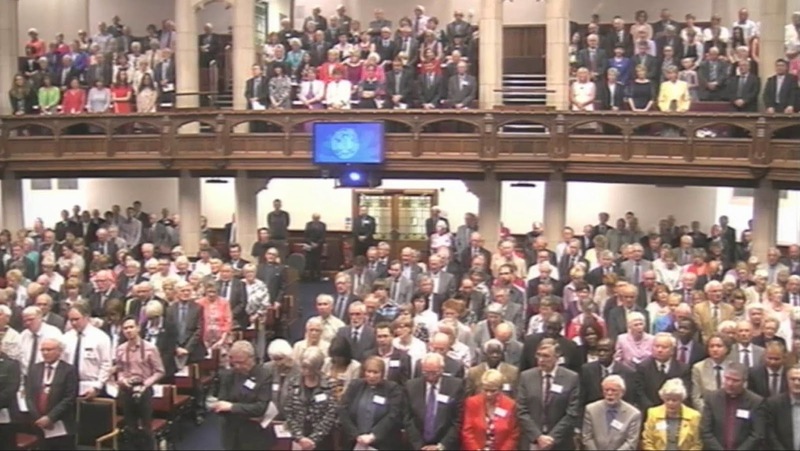 There were a number of elected representatives from some of the political parties, and at the end of the service, and following a few speeches, one of the MLAs – who is neither a Presbyterian nor a unionist said, “There is one thing about you Presbyterians – you can sing and you can talk”. I think that tonight we have proved him right. I always enjoy Opening Night at the General Assembly – I have missed very few over the years. I usually sit to the left, on the front row so that I can stretch my legs. Tonight you have provided me with an even more comfortable seat, although part of me wishes I was sitting in my usual place. But the singing has been wonderful. Rob’s speaking has been a blessing. We are almost finished, but not quite. I have the responsibility of painting in broad strokes, and briefly, a picture of our theme for the next twelve months. This is a theme I am happy to endorse and throughout this year will take the opportunity to promote these twin elements of Church membership. You will learn more about this theme during the week. At worship on Wednesday and Thursday my Chaplains will direct our thinking and on Wednesday night at the Assembly Rally. That will be a less formal occasion and those who will be taking part will give you a flavour of what we will be emphasising in the coming year. How can the Church do what it is called to do in the best possible way? How can she be effective in her mission in the world? How can we make a difference to the world in which we live? “Consider others better than yourselves.” What radical thinking that is for our day. We live in the age of the celebrity, indeed the cult of the celebrity, where we see people, some of whom have talent, others with no talent, being worshipped by their fans who ensure they are lifted up on their pedestals. And to stay on that pedestal they have to indulge in self-promotion. These words of Paul are so alien to those who must put themselves first so as not to be overtaken by the myriad wannabes waiting in the wings. But lest we concentrate exclusively on the cult of the celebrity, let me remind you that Paul is not writing to the celebrities of his day who are engaged in self-promotion; he is not writing to the business tycoons who trample all before them to build their empire; he is not writing to the politicians who promise the world for a boxful of votes. Paul is writing to ordinary church members like you and me. This is a message directed to every member of the church. But I must protest Paul. I would never act “out of selfish ambition or vain conceit”. I would never do anything by “complaining or arguing”. And yet Paul found it necessary to write those words to the believers at Philippi. Why? Because that is how they were living – ‘me first’. But ‘me first’ comes at the expense of someone else. It is not a neutral activity. ‘me first’ always has a victim. Do we not see ‘me first’ all around us. When people demand their rights are they not demanding their way? There are those who demand the right to march and those who demand the right to protest. But where does such behaviour take us when there is no respect for the other person? We saw the answer to that last year in the rioting that blotted this city – behaviour that must not be repeated this year. We see ‘me first’ in the attacks on people who are perceived to be different in some way. The Honorary Consul for Poland lives in Newry and he has expressed his concern to me about the attacks on Polish people. And of course it is not just people from Poland, and it is not just because of a person’s nationality. All such attacks are an affront to us as a democratic and civilized country. That is behaviour that must stop immediately. It is against this ‘me first’ mentality that the apostle is writing. Of course I wouldn’t engage in such behaviour, but I wonder do I harbour any kind of superior attitude in my heart towards anyone who is different from me. Am I better than others because I am white and they are not? Am I better than others because I am Protestant and they are not? Am I better than others because I am heterosexual and they are not? The answer is a clear ‘No’ and we must never do or say anything that would give the slightest comfort to those who would attack verbally or physically people they do not like. One thing I have been discovering in the last few months is how difficult it is to speak – and to be understood correctly. Words can be interpreted in a way we never intended. We can be misunderstood so easily. And of course there will always be those who will deny us the right to speak if they disagree with us, claiming that our words are inflammatory. Yes we must be careful what we say and we must be careful to say it in a clear and gracious manner. But we must also be allowed to state our case even when others disagree with us. The Bible is very clear that we are to be loving and caring to all people. Throughout the Old Testament the people of God are called on to look after the needy both within their own community and also those who are sojourners – those foreigners who reside in their community. Indeed the language is unambiguous. In a section on social justice God says to the people “You shall not wrong a sojourner or oppress him, for you were sojourners in the land of Egypt”. And again in Deuteronomy, “Love the sojourner”. And that teaching is carried into the New Testament. When Jesus wanted to emphasise the standard of judgment he would use at the last great Day, he did so in terms of social justice – “’For I was hungry and you gave me food, I was thirsty and you gave me drink, I was a stranger and you welcomed me, I was naked and you clothed me, I was sick and you visited me, I was in prison and you came to me”. But why should we have any regard for other people at all? Why care for them? And why should we care about those with whom we disagree? Why care for those who are our enemies? The Bible is very clear, and I take the Bible literally when it says, “The Lord God formed the man of dust from the ground and breathed into his nostrils the breath of life”. We are to treat all people with respect and dignity because they have been created in the image of God. So when I attack another person, whether physically or verbally or emotionally, I am attacking one who bears the image of God. Rather than attacking such people we are to be their servants. Why? Because of the example of the Lord Jesus Christ. That is what Paul is saying here in Philippians 2. This is a passage that many Christians know, but we do not always appreciate the implications of its teaching. Paul goes on in his letter to show what was behind Jesus’ love, and how we can follow his example. The first thing we notice is that he humbled himself. Who is Jesus? The Bible tells us that he is no ordinary man and the evidence supports this claim. Many who examined his life have reached the same conclusion. Jesus is in nature God. He is eternal; he is the Creator of all things, and indeed all things were made for him. He ruled with God in glorious splendour, accepting the praise of all that he had made. Yet, says Paul, he made himself nothing. That is very difficult for us to take in. We might well show signs of humility, but so often it is not very strong, and perhaps it is even false humility. We need to guard against false humility for it is all too easy to think of ourselves as being humble. But the humility of Jesus was not false in any way. We know it was genuine because it was not simply a verbal profession. Jesus showed his humility in the way he lived. He took the very nature of a servant. We cannot appreciate the full significance of that statement. We think of a servant in terms of Downton Abbey with Mr Carson or Mrs Patmore or Daisy. Or some of you might just remember the hiring fairs around Ireland 70 years ago. But the life of a servant 2000 years ago was very different. The servant may have been a slave, a person not free to do his own bidding. Or he could have been a volunteer who chose to do someone else’s bidding. But the humility of Jesus went even further than being a servant. Although he is God, he became obedient to death. Even though he is the Creator and Ruler of the universe, he did not insist on holding on to his rights. We hear much about rights today. People are demanding their rights. If anyone had rights, it was Jesus. But he was willing to set them aside because he loved us. He became obedient even to the point of death. That is what we should be like. That is what we must be like if we are to care deeply for other people. We can act humbly, without being humble. But true humility must begin in our minds, and the only way to live a truly humble life is to have the mind of Christ. But what does it mean for us to wash one another’s feet? It means that we are constantly watching out for the opportunity to serve other people. We should be aware of their need, and we must be willing to adopt any position in order to meet it. We must be willing to sacrifice whatever we have or whatever we are in order to help them. To serve in this way is to care deeply for people. As the family of God that starts in the congregation. Do you care for the marginalized who seldom come? Do you care for those who hold strange ideas? Do you care for the minister and his family? This was brought home to me just over a year ago. We were looking forward to a visit from the then Moderator Dr Roy Patton. One of our fathers was explaining to his children that the Moderator was going to be at church the next Sunday. “What is a Moderator, Daddy?” his daughter asked. Now at first I laughed. Someone recognised my capabilities. But as I thought about her words, I wondered how many seven year olds, or seventeen year olds, or seventy year olds cared so much about their minister? I was humbled and touched that a child cared so much about me that she didn’t want to hurt my feelings. Do you care about your minister as much as that? We are to be people of service. But our theme is to be a people of service and outreach. Jesus gave us the command to go into all the world making disciples. And here Paul calls on us to “shine like stars in the universe as you hold out the word of life”. The early church that we read about in the book of Acts was a church that held out the word of life to all those around it as it proclaimed the gospel – the good news about the Lord Jesus Christ. Isn’t it interesting that Paul uses this phrase – ‘the word of life’. This is a message that brings life to those who are spiritually dead. We are to live lives of service in the world but that must not stop at being good neighbours. Jesus calls on us to be salt and light. If salt and light are to be effective they must act. The light must permeate the darkness and the salt must permeate the meat. So the followers of Christ must get out into the world. We must show the people outside that we love them more than we love ourselves. And we cannot discriminate. We must not choose who we are going to love, who we are going to reach out to. The light goes to all the darkness. The salt goes to every part of the meat. “Shine like stars in the universe as you hold out the word of life”. In the past our church has tended to say to the world, “Come and listen to us” whereas Jesus said “Go into all the world”. So let us reach out with the word of life to all the people who are separated from God. This afternoon, the team behind the @pres_church parody twitter account hung up their smart phones and retired. They issued a statement in which they outlined their motivation for starting the account, as well as the thought processes behind their observations and parodying campaigns. As the group say "parody is very effective" ... though it can also really needle people and wobble all over the line of what's deemed to be "decent and in order". That's the risk with parody. Real people have certainly been hurt and offended by some of the content, and not everyone has seen the funny side ... or appreciated the critical eye being cast over the denominations foibles. On balance, I mourn @pres_church's passing and the end of their input and critique. We are continually disappointed, dismayed and frustrated at the lack of authenticity in PCI ... Let's be honest, we know what the church should be because Jesus gave us a very specific blueprint in Acts. But PCI today in many parts is very far from that. They also reflect on church leaders often being "silent" about issues of injustice. While statements take time to draft and agree, PCI could be a much more powerful voice and witness in the news cycle of some relevant stories if it spoke 48 hours earlier than it tends to manage. @pres_church's farewell address is worth a read, even if you think you'll disagree with their means or their dissenting voice. After all, Presbyterians have a long - and proud - history of dissent ... The message over the last 18 months from @pres_church may not have been comfortable, but it is one that needs to be grappled with. It reminds me of a piece I was asked to write for the News Letter around the time of General Assembly a couple of years ago. I can still stand over what I said and reproduce it below. Later on tonight, the outgoing moderator Dr Rob Craig and the incoming moderator Dr Michael Barry will both address the Opening Night of this year's General Assembly. You can listen to them on Radio Ulster 1341 Medium Wave - or watch it streamed from the PCI website. I trust that the folks behind @pres_church will like what they hear about the church needing to be "a people of service and outreach" and our need to be servant-like in our attitudes to others, both in and outside of the Church. Though I'll understand that actions over the next year will speak louder than words.